A nasobuccal membrane separates the oral cavity inferiorly from the nasal cavity superiorly. As the olfactory pits deepen, the choanae are formed. Primitive choanae form initially, but with continued posterior development, the secondary, or permanent, choanae develop. By 10 weeks, differentiation into muscle, cartilage, and bony elements occurs. Failure of these carefully orchestrated events in early facial embryogenesis may result in multiple potential anomalies, including choanal atresia, medial or lateral nasal clefts, nasal aplasia, and polyrrhinia. Neonates are obligate nasal breathers for the first 6 weeks. When bilateral choanal atresia is present in a neonate, emergency action is needed. Like the underlying bony-cartilaginous framework of the nose, the overlying skin may also be divided into vertical thirds. The skin of the upper third is fairly thick but tapers into a thinner, mid-dorsal region. The inferior third regains the thickness of the upper third owing to the more sebaceous nature of the skin in the nasal tip. The dorsal skin is usually the thinnest of the 3 sections of the nose. The difference in the skin thickness must be appreciated during dorsal reduction. The nasal muscles are encountered deep to the skin and consist of 4 principal groups: the elevators, the depressors, the compressor, and the dilators. The elevators include the procerus and levator labii superioris alaeque nasi. The depressors are made up of the alar nasalis and depressor septi nasi. The compressor of the nose is the transverse nasalis, whereas the dilators are the dilator naris anterior and posterior. The muscles are interconnected by an aponeurosis termed the nasal superficial musculoaponeurotic system (SMAS). The internal nasal lining consists of squamous epithelium in the vestibule. This transitions to pseudostratified ciliated columnar respiratory epithelium with abundant seromucinous glands within the nose. 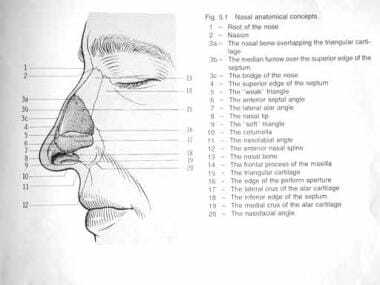 Nasal subunits include the dorsum, sidewalls, lobule, soft triangles, alae, and columella. The external nose is supplied by the facial artery, which becomes the angular artery coursing over the superomedial aspect of the nose. The sellar and dorsal regions of the nose are supplied by branches of the internal maxillary artery (namely, the infraorbital) and ophthalmic arteries (which are from the internal carotid system). Internally, the lateral nasal wall is supplied by the sphenopalatine artery posteroinferiorly and by the anterior and posterior ethmoid arteries superiorly. The nasal septum also derives its blood supply from the sphenopalatine and the anterior and posterior ethmoid arteries with the added contribution of the superior labial artery (anteriorly) and the greater palatine artery (posteriorly). The Kiesselbach plexus, or the Little area, represents a region in the anteroinferior third of the nasal septum, where all 3 of the chief blood supplies to the internal nose converge. Veins in the nose essentially follow the arterial pattern. They are significant for their direct communication with the cavernous sinus and for their lack of valves; these features potentiate the intracranial spread of infection. Even with the abundant blood supply of the nose, smoking does compromise postoperative healing. The sensation of the nose is derived from the first 2 branches of the trigeminal nerve. The following outline effectively delineates the respective sensory distribution of the nose and face of the trigeminal nerve. Nasociliary - Skin of the nose and mucous membrane of anterior nasal cavity. The parasympathetic supply is derived from the greater superficial petrosal (GSP) branch of cranial nerve VII. The GSP joins the deep petrosal nerve (sympathetic supply), which comes from the carotid plexus to form the vidian nerve in the vidian canal. The vidian nerve travels through the pterygopalatine ganglion (with only the parasympathetic nerves forming synapses here) to the lacrimal gland and glands of the nose and palate via the maxillary division of the trigeminal nerve. Superiorly, the paired nasal bones are attached to the frontal bone (see the images below). Superolaterally, they are connected to the lacrimal bones, and inferolaterally, they are attached to the ascending processes of the maxilla. Posterosuperiorly, the bony nasal septum is composed of the perpendicular plate of the ethmoid, shown in the second image below. Posteroinferiorly lies the vomer, which in part forms the choanal opening into the nasopharynx. The floor consists of the premaxilla and the palatine bones. 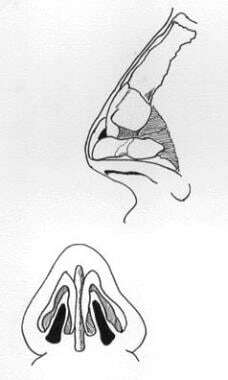 Nasal anatomy. Image used with permission. The quadrangular cartilage, the vomer, the perpendicular plate of the ethmoid and aspects from the premaxilla and palatine bones form the nasal septum. 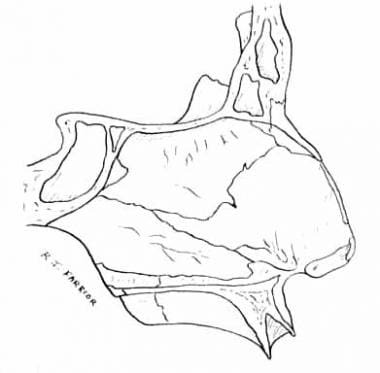 The cartilaginous septum extends from the nasal bones in the midline above to the bony septum in the midline posteriorly, then down along the bony floor. It assumes a quadrangular shape. Its upper half is flanked by 2 triangular-to-trapezoidal cartilages, called the upper lateral cartilages, which are fused to the dorsal septum in the midline and attached to the bony margin of the pyriform aperture laterally by loose ligaments. The inferior ends of the upper lateral cartilages are free. The internal area or angle formed by the septum and upper lateral cartilage constitutes the internal valve. Adjacent sesamoid cartilages may be found lateral to the upper lateral cartilages in the fibroareolar connective tissue. These are found variably. Beneath the upper lateral cartilages lie the lower lateral cartilages, shown below. The paired lower lateral cartilages swing out from medial attachments to the caudal septum in the midline, called the medial crura, to an intermediate crus area. They finally flare out superolaterally as the lateral crura. These cartilages are frequently mobile, in contradistinction to the upper lateral cartilages. Nasal anatomy, base. Image used with permission. In some individuals, evidence of a scroll may exist, that is, an outcurving of the lower borders of the upper lateral cartilages and an incurving of the cephalic borders of the alar cartilages. Several variations exist, as depicted below. 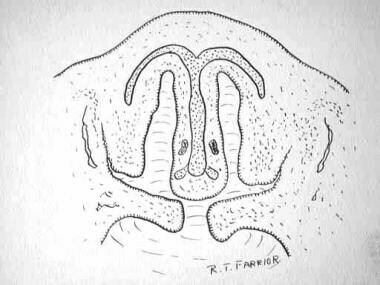 The first image below depicts the external nasal anatomy. Nasal subunits include the dorsum, sidewalls, hemilobules, alae, soft triangles, and columella. Ethnic influences can result in different appearances of the nose,  as follows: Caucasian, leptorrhine; African American, platyrrhine; Hispanic, paraleptorrhine; and Asian, subplatyrrhine. The external valve is a variable area dependent on the size, shape, and strength of the lower lateral cartilage. The internal nasal valve involves the area bounded by upper lateral cartilage, septum, nasal floor, and anterior head of the inferior turbinate. This makes up the narrowest portion of the nasal airway in the leptorrhine nose. Generally, an angle wider than 15° is needed in this area. 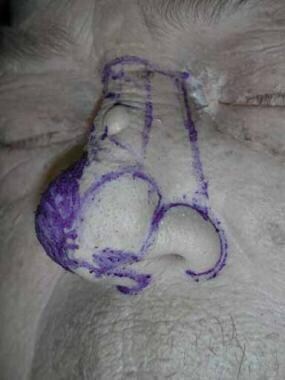 The width of the nasal valve can be increased with spreader grafts and flaring sutures. The nose can be conveniently divided into several subunits: the dorsum, sidewalls (paired), hemilobules (paired), soft triangles (paired), alae (paired), and columella (see the image below). Viewing the external nasal anatomy by its subunits is important, because defects that span an entire subunit are usually repaired with reconstruction of that subunit. Burget suggests replacement of the entire subunit if more than 50% of the subunit is lost during resection. Aesthetically, the nose—from the nasion (nasofrontal junction) to the columella-labial junction—ideally occupies one third of the face in the vertical dimension. From ala to ala, it should ideally occupy one fifth of the horizontal dimension of the face. On profile view, normal columella show, ie, the height of the nasal aperture visible, is 2-4 mm. The dorsum should be straight. From below, the alar base forms an isosceles triangle, with the apex at the infratip lobule just beneath the tip. Appropriate projection of the nasal tip, or the distance of the tip from the face, is judged by using the Goode rule. Tip projection should be 55-60% of the distance between the nasion and tip-defining point. A columellar double break may be present, marking the transition between the intermediate crus of the lower lateral cartilage and the medial crus. Hengerer AS, Oas RE. Congenital anomalies of the nose: Their embryology, diagnosis, and management (SIPAC). Alexandria, Va: American Academy of Otolaryngology; 1987. Jafek BW. 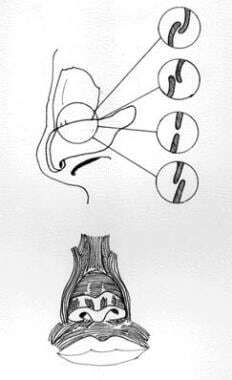 Anatomy and physiology of the nose. Jafek BW, Stark AK, eds. ENT Secrets. Philadelphia, Pa: Hanley & Belfus; 1996. 77-83. Heidari Z, Mahmoudzadeh-Sagheb H, Khammar T, Khammar M. Anthropometric measurements of the external nose in 18-25-year-old Sistani and Baluch aborigine women in the southeast of Iran. Folia Morphol (Warsz). 2009 May. 68(2):88-92. [Medline].